Protesters marched along the Fort Meade compound showing support for Bradley Manning in Fort Meade, Maryland, December 17, 2011. While a case against a young U.S. soldier blamed for leaking thousands of classified and sensitive official documents resumed in a military court Saturday, supporters gathered outside to hail him as a hero. The day was also Private First Class Bradley Manning’s 24th birthday. Hundreds of protesters said they wanted to give Manning all the support they could, and marched along the base’s gated compound where the hearing is taking place. Some drivers honked in support, while others rolled down their window yelling “traitor." But army veteran Ellen Barfield said Manning was a hero to many. “People who have inside information that the public should know about and they disclose it, I consider heroes," she said. "We do not know if that is what Bradley Manning did but that is what he is accused of and a lot of us, all of us here, consider him a hero." Cartoonist Seth Tobocman who was drawing new protest signs said Manning had continued to impress him since the hearings, expected to last about a week, began Friday. “I can tell from seeing him in court that he is a strong guy and he should just stay strong and keep focused the way he is doing," Tobocman said. 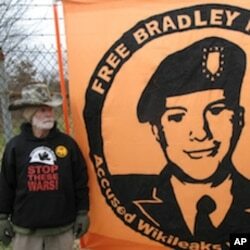 A veteran was among those supporting Bradley Manning. The hearings are to determine whether prosecutors have enough evidence to bring Manning to a military trial. Manning, who was an intelligence analyst stationed in Baghdad, is accused of leaking hundreds of thousands of sensitive items, including Iraq and Afghanistan war logs, which were then released on the WikiLeaks website. Charges range from the theft of records to allegedly aiding the enemy. The U.S. government has also said the released information threatened military and diplomatic sources, while also straining relations with other governments. Lawyers for Manning say they will argue much of the information posed no risk. Manning’s court appearance Friday was his first in public after 19 months in detention. One of the protest organizers, Jeff Paterson, from the organization Courage to Resist, called for continued engagement. “We are going to do everything to free Bradley Manning, by supporting the legal team, by changing public opinion so people realize Bradley Manning is a true whistleblower, in every sense of the definition, in democracy both American and around the world,” said Paterson. His supporters say some of the leaked information inspired the Arab Spring protests which already toppled several authoritarian regimes in North Africa and the Middle East this year and led to the Occupy movements in the United States, which target corporate greed and inefficient governance. Many of the protesters Saturday in Fort Meade were bused in from Occupy movements from different U.S. cities. They said the fight to free Bradley Manning was part of a larger movement, which they hoped would lead to what they called "an American Spring" in a few months.